It goes with the territory that to “think through” how a live performance produces knowledge, ideas, concepts, and resources for imagination, decision, and action, means engaging in a provisional mode of knowing—or unknowing. In short, you have to be part of the production. Particularly, I would say, the part that gets to replay the production, during and after the experience, by way of remembering, report, critical description, anecdote, and such. That does not, in fact, mean you have to be there. One can attend through report, rumor, anecdote, and so on, closely or distractedly as it may be. But one attends, in any case, to what goes on, to what follows, what assembles and differentiates and promises and undoes itself. As I have suggested elsewhere, one suffers the images. Something I found myself attending to and thinking about during this summer (and I shall be working through some examples in what follows) was what appeared to be images of preparation for, or presentation of, groups or constituencies of one sort or another: passersby, visitors, local residents, perhaps, to be invoked or induced, or already brought in—from “outside.” Including (and there will usually be one such event at every festival) those who are not invested, or those without a price of a ticket, or those who are far away. As if the theater—to the extent that theater was ever the issue at all—had been stripped down to this fundamental problematic, that of an outside to be brought inside, in the form of a public; or if not yet an actual public, then people who will set out about becoming, imagining, or performing one, producing the sort of knowledge required to do that, knowledge that can then be sent outside again, made use of, put to work. As if, strangely enough, there were not already a public “there,” in the gallery, in the theater facing the stage or performance area, or “at” the event, one way or another. I have to say, none of this line of thought is unprecedented, and I shall speak later of at least one recent book among several that pursue some of these issues in greater theoretical detail than I can allow myself here. What is perhaps worth noting, however, is that all of these books in one way or another explore theater’s porosity (or so we might call it) as it has been exposed to what Alan Read in his book has referred to as the “expanded field” of performance, of social and activist works, and a whole range of other art forms and knowledge-producing practices. As if it were not theater we had in our sights anymore, but a sort of post- or renewedly pre-theatrical culture of collective gathering, of platforms and appearances, and repurposed representational devices from another era. At the same time, it appeared that another, more extensive sort of porosity had been in the air for a while. Call it a porosity of worldly imagining, tuned to the mass migration of people in the wake of civil and transnational wars, or to the effects of global economic and ecological catastrophe, or the exponential “securitization” of the world, that was generating new narratives of exclusion and inclusion, new porosities, new impermeable borders. It appeared, too, that where the question was being asked of these porosities, these missing publics, the form the question took was one of number, and anonymous number at that; rather than, say (in the way of the old drama), the characterful distinctiveness of the promising hero or interfering stranger. No doubt that has to do with countering various modes of identitarian chauvinism, as well as grasping something of the scale, the sheer vastness of number, of worlds, of people, that constitute the outside for any of us. Again, we shall be coming back to this question of scale in what follows, specifically with regard to a geometrical “plotting” in the space of performance that may serve representational and performative functions in the same gesture. What number also does, however, is posit quantity over singularity, and also over difference, in the sense perhaps of a pre-political gathering of equalities, at the level of acknowledgment and of the basic necessities of survival, in advance of the public business of action and speech where—it is to be supposed—the proper politics will have begun. We might, though, before we suppose so much, want to hang back with the performances for a while, attending to how they do their work, of knowledge production or whatever it may be. Which is to say, describing—thinking through again, alongside the work itself—what goes on, and what might be made of that. 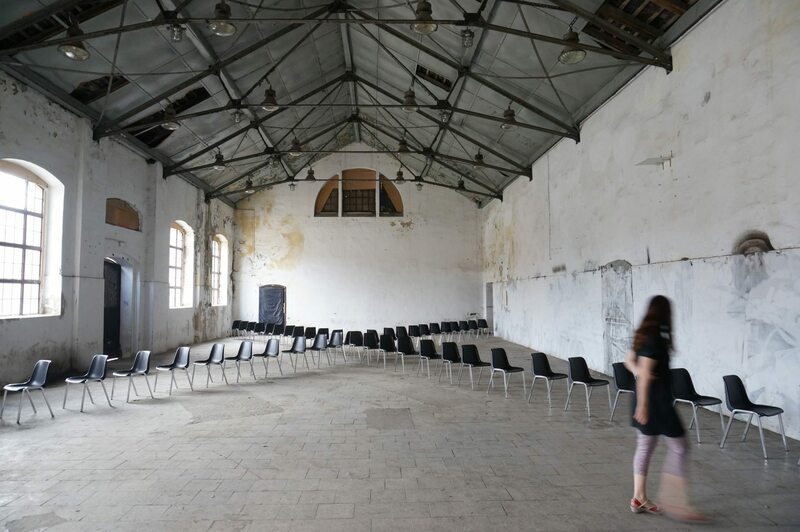 It is eleven in the morning and Vlatka Horvat is putting out chairs—identical black plastic chairs—which she places just a little offset from each other to make a large communal circle. Or, instead of that, a number of smaller rings of chairs: sub-groups, break-outs. Or she puts them beside or in front of each other, in rows, in columns, or set up like a diamond, a cross, or a kind of phalanx, facing in or facing out; or perhaps just a long line of chairs, or two long lines in confrontation, or else back to back, extending the length of the space. Each arrangement takes a while to assemble, or to disassemble from the previous state; she works methodically, moving one or two chairs at a time (there are fifty in total), and she has already been doing this for an hour. There are seven hours more to go: a working day. Apart from someone whom I take at the time to be an assistant or colleague of Horvat’s, who is taking photographs, documenting the process, I am the only other person here right now, and it will remain this way for a while. The place we are in is a large, brick-built shed-like building, with a vaulted roof, white-painted damp-stained walls, high windows along one side, and the entrance gaping to the world beyond. You would have to come inside, though, to see what is going on; and you would have to make the short trip across town to this repurposed old slaughterhouse in order to do that. Which some people do, even riding in on bikes, looking around for a while and then departing. Fair enough, I suppose, since my understanding is that the work is designed to be encountered by passersby, although usually from a greater distance than today. This Here and That There has previously been performed outdoors, and on most occasions in wide expanses of shallow water. I imagine that has the effect of slowing down Horvat’s movements even more, adding an element of strain, the uncertainties of weather, the back and forth through the resistant liquid, the getting and placing of chairs in more distended configurations. I imagine, too, this would make the configurations appear somewhat inaccessible to whoever might be looking on, in the sense that you would not think of yourself as likely to enter the picture and be sitting on one of those chairs, out there in the water, exposed like that. But then, at the same time, more accessible to the eye, and also to those who have not made an appointment with the piece or read something about it in an arts festival program, but who happen to be there and who might well be drawn in to take a closer (or longer) look. And, in so doing, if only in wisps and threads—even at such a distance, whether in interest or indifference—to hint at a passing public, a real-world public, so to speak, out there at the fringes of the resolutely non-appearing and, I suppose, fictional congregation that Horvat would seem to be invoking through her labors. Fig. 1. Vlatka Horvat. This Here and That There (Poznan). Photo: Tim Etchells. Image courtesy the artist. As it is, today’s venue is something of a last-minute accommodation to extreme meteorological contingency; the previously planned and advertised site in a shallow water tank in a local park in Poznan in western Poland, where the performance is being hosted as part of the 2015 Malta Festival, having been made unusable by heavy rainstorms the previous afternoon. So it is that those of us who will, over the length of the day, make up the public (or the audience) in the present situation are less like passersby and more like dedicated attenders, or “attendeers” to borrow a phrase, a little closer to the action, and just a little bit more removed, perhaps, from the “outside” that, nevertheless, we cannot help but bring inside with us, along with our distracted curiosity, our bits of chatter, our bits and pieces of personal equipment (bikes, phones, bags, etc. ), and along also with our “decision” to stay here for a while. Horvat, meanwhile, pays us no mind, as if she would carry on doing what she is doing whether there were anyone there or not (which for the first hour this morning was pretty much the case), composing patterns with the empty chairs, performing her own sort of capable solitude. It is, I am thinking, not unlike the solitude of a writer, putting finite lines and other such structures together “simply” by adding unit to unit, chair to chair, for anyone, for no one. And with something also of a writer’s relation to her readers, which here is a kind of relation of non-relation, however close they are standing, to her or her work. Readers, visitors, that is to say, those who will have come of their own accord and more or less in their own time, to make of what is taking place between herself and them—the woman who is moving back and forth, picking up and placing chairs, her sandals shuffling audibly, the chair legs scraping on the stone floor, putting together these oddly measured but mutating forms—to make of all this a legibility, something to work with for oneself. Except one does not arrive here in one’s own time, not entirely, for all the apparent license of the “durational” performance; and unlike words on a page, or even a screen, the patterns here do not remain (nor, I believe, are any of them repeated): at least, they are not “saved” or archived by the medium itself. Hence, perhaps, the urge to photograph each state once it has been completed, to register the artist’s attempt at drawing pattern and dynamics from the inertia of objects, to keep that with you, to take home later. As it is, the legibility of the work—not just the forms, but the way we might read the forms—itself tends to entropy, to transform from one sort of thing to another. Or so it was for this visitor (others have made a similar point) for whom, as mentioned already, the various configurations resembled repeated attempts at an arrangement for, or reminiscent of, human assembly, suitable for dialogue, for confrontation and argument, for decision-making and deliberation. At the same time, Horvat’s own continual actions evoke the now perhaps familiar figure of the “artist at work,” the would-be social experimenter, virtuoso agent and convener of discursive and affective relations, deviser of projects, and denizen of what Bojana Kunst and others have called “projective temporality,” an immaterial laborer traipsing around the space for hours on end with the all-too material objects of her task, imagining a politics to come and staying hopeful with it. I was reminded, too, as she went about her business, of the pre-political labor of porters and cleaners, of interns, assistants, group leaders, and teachers “on their break,” putting out sets of chairs, before the people who are supposed to be here arrive and the real business can start. Perhaps, indeed, all too pre-political. At one point, Horvat kicks the chairs together into a heap, returning them to a chaos of objects. After all, it is not as if an actual public are going to arrive and sit and talk. Not that we, the spectators, ever imagined that they would. Maybe, eventually, we just stop imagining them, or we stop imagining them as anything more than an abstract possibility. We come to terms with the fact that chairs (as chairs) have little more to reveal of themselves than is given on first encounter, although they can stand for other things. And so, as things go on, other connotations come into play: children’s games, ascetic exercise, a ritual of expulsion and introjection, this here and that there, a repetition compulsion, or a cultivated pleasure in pattern and plasticity. Or perhaps simply a form of “art,” for example, a sort of abstracted, slowed down action sculpture, or a kind of indoor land art—media: chairs on concrete, with daylight, movement and duration—the sense of exhibited design honored by the fact that visitors mostly stand away from what Horvat is doing, so as to have everything “there,” in the eye, in the pictorial plane; intuiting something that causes us to grant that plane—whether indoors or out, on dry land or not—the status of a platform, something like a stage. And, alongside all, an audience, who may recognize their role as a performing public, while registering at the same time something of their removal from an outside world that is vaster than any of this, but which is, even so, only a couple of steps away. We might think of them as geometries, these patterns, these lines and points and intersections that measure and divide the space. I was recalling, as I watched Vlatka Horvat’s performance, work by cultural and intellectual historian Henry S. Turner, who has written of the emergence of the early modern theater in rapidly urbanizing London at the turn of the seventeenth century, as dependent on the utilization of what he calls the “practical spatial arts.” These were those indispensible arts and practices by means of which new ideas were given expression and made “thinkable and distinct” through “highly self-conscious interpretative protocols.” That is to say, made legible to developing social formations and, at the same time, contributing to the invention of those institutions (such as the theater) through which these social formations made their own practical and poetic claim on historical appearance. Notable amongst those arts was geometry, an “entire system of representation,” Turner writes, to rival language. Again, not unlike theater in being a fictional system (i.e., requiring an imaginative contribution to make its fictions plausible), in which “bodies, places, and ideas” might be rendered “conceptually equivalent to one another.” As Turner puts it, geometry’s establishment of “quantitative rather than qualitative similarity among heterogeneous elements becomes a principle of ‘turning’: of revolving like a mechanical globe but also of mutation and transformation—of ‘translation,’ in its Renaissance sense of ‘changing form.’” And what sorts of translation were made possible? Well, geometrical form—not unlike that of the theater—was a matter of conceptual analysis allied to highly codified visual demonstration, through “ostensive” elements (points, lines, figures, and such) that could be taken as “signs of something else.” Practically, this enabled the legible imagining at manageable scale of a building or a public works, a device or a machine, a piece of civic pageantry or an engine of war or trade, existing in the world or yet to be constructed. Practical geometry’s calculative, mimetic poetic and performative mode of knowledge, its “ceaseless iteration of figures, lines and units,” could be put to work by means of plots or “platts”: two-dimensional diagrams and spatial patterns such as a mason might use or a surveyor might devise, to describe and instruct in acts of measuring and making. Or, alternatively, such as a playwright or stage manager might mark up in their own professional context, to effect translations between the two-dimensional platt and the three-dimensional platform, to measure out the actions that will happen on stage. So that, when an actor happens to enter from within, he might be understood as bringing a world on with him—Bohemia, a magical island, a heath, the Dover cliffs—to be initiating or securing a scene that may well have happened or be happening somewhere else, but is here drawn to scale and embodied in iconic substitution (this body stands for that other body; that body stands according to whatever the spectator, by his or her cultural lights, can imagine a body to be or mean or do). This is, though, in early modern theater at least, a “perforated” iconicity: there is always an outside, an offstage, a projected actuality aside from the theatrical representation; indicative, so the late modern critic Turner would have it, of the sorts of displacements and oppositions upon which the broader culture of that time was given to turn. What, then (to return to the example of our own scene), of the undisguised and unmitigated plotting of geometrical, or geometrical-seeming, figures: lines, circles, squares, and angles, intersecting and departing from each other in what we might in fairness take as Horvat’s post-theatrical performance at the Old Slaughterhouse in Poznan? The work is as exhaustive in its methodical way as we could ask such a performance to be, and what if the quotient of iconicity is severely reduced (or else, exhausted: the human multitude, the coming community evoked by those few dozen plastic chairs can, it seems, barely be bothered to turn up, let alone identify themselves)? Still, there is no lack, by way of those tall open windows and carcass-high doors, of a perforating outside to match anything that the “Wooden O” of the early modern theater had to offer. Indeed, I can imagine what, for me, would be remote times and places being rendered to scale in these arrangements, the mass ornaments and assemblies, perhaps, of Horvat’s youth in communist former Yugoslavia, recalled to recognition and mis-recognition now for spectators representative both of the former East and the former West. As if the differences—in how the seats are arranged, in who notices what and when—really do make a difference to how people might encounter each other, how we might assemble. Or they do, for a moment, before they collapse in mind, like any series of differences, as so many variations upon the same thing, the same gesture. There is, anyway, little sense here of a performer playing “to” or “for” anyone, nor of any particular demand or claim being made through these (basically) codeless patterns that, if they do speak to a shared, conventional recognition, then it is that of the almost nostalgically conventional, productively unproductive eight-hour working day, which here is being rendered not without an element of fictionality. As I say, I spend most of the day watching things unfold. I make some notes. I take some photos with my phone. It strikes me at the time that the photographs I am taking do not capture what I am experiencing: the space itself and the sense of other people when they do arrive, the weight and balance of the chairs, Horvat’s movement amongst them, the afternoon light and the distant traffic noise registering the porous limits of inside and out. Later, though, I am not sure: maybe the photos show enough after all, or I find enough in them. As it is, with a performance this long and set up in this way, most spectators only come for a while: we see some of what goes on and project the rest—the event is no less virtual than it is actual. As for the work itself in its totality, by the time I leave, it has become something that has been made—self-making, self-remembering, and self-forgetting—from the tracing of all of its abandoned and emerging states, the ones we get to see and also the ones we do not. That, and Horvat’s own sort of “ordinary language” choreography that holds it all together, as analytical and ostensive as you like, but saying nothing more than what is shown, taken apart, and put together again, plotting it all out in the sight of whoever comes, amongst the nothing being said of the no one else there. Only two days previously, however, the chairs were all filled with people and the hours full of speech. I had arrived in Poznan in the afternoon, and had booked for two performances that same evening, 15th Extraordinary Congress, again by Vlatka Horvat, and then later on Edit Kaldor’s Inventory of Powerlessness. Both pieces are based around relatively simple serial structures: in each, a number of local participants—which meant that the voices that I heard on this occasion were largely Polish-speaking—in turn offering short speeches, statement, testimony, anecdote, and reflection in response to a shared theme, a collective circumstance. 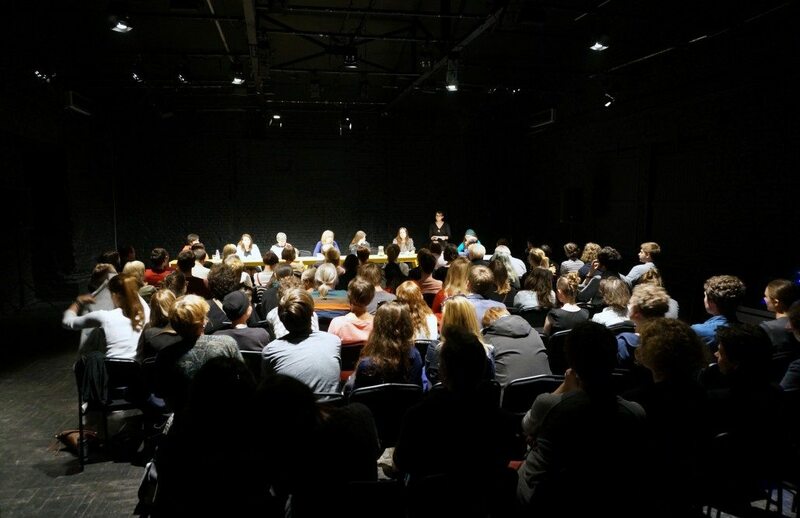 Spoken translation embedded in each performance situation, given that the speeches were largely improvised and unpredictable, helped to thread together the collectivity, both onstage and between performers and audience, while drawing attention to the fact that what gets collected is not necessarily held in common; not without some effort from somebody. At Kaldor’s event, a handful of English-speaking visitors squatted as best we could around a couple of “whisperers” in the packed auditorium, while over the course of two or three hours, one after another, a potentially endless sequence of individuals—some of them pre-prepared and then, as things went on, supplemented by volunteers from the audience—stepped down to the otherwise unadorned stage-space to speak into a microphone about everyday experiences of powerlessness. They speak of incapacity, of disability. not least with regard to what otherwise counts as social, physical, economic, cognitive, and communicative ability in this or that given world where anyone is bound to live. Some acknowledge surmountable fragilities; many others speak of more intractable exclusions, darker and heavier solitudes: chronic illness, bereavement, bills that cannot be paid, a job lost, a home lost, cruelties and injuries suffered at the hands of others. At the back of the stage, an enlarged computer screen plots it all out: words and phrases, fragments of testimony accumulating in a tangle of letters that are perpetually being rescaled to legibility, with diagrammatic lines being pulled between the phrases to indicate what are referred to during the performance as “connections”; associations, an inventory of powerlessness, an elaborate geometry of disadvantage and frustration standing in for a map of the city. By the end of the evening, similar maps from other previous performances form a palimpsest diagram of a world—our European world, or something of its aspect, filtered through the experience of some of its weaker, more under-represented citizens. Earlier in the evening, Horvat’s 15th Extraordinary Congress (titled after the fourteenth and final congress of the League of Communists of Yugoslavia in 1990, the interruption of which preceded the eventual breakup of that country) followed a more strictly structured seriality (time-limited speeches, pre-selected but randomly ordered topics) than Inventory of Powerlessness, but no less “flat,” we might say—or, no less insistently returning upon and re-translating itself—in its dramatic development, if we can speak of such. Over four hours, a professional translator and a local moderator facilitate between a group of six women currently living in Poland (with Horvat herself making up a seventh in the group), all of whom were born and brought up under Yugoslavian socialism, and who have been invited here to reflect variously (politically and personally, and then all points in between) on their memories of a country that no longer exists. It is, like Kaldor’s, a performance that knows and understands itself, what it is made of, and of what it speaks. Its concerns are not so much to be devised or projected by an onlooker, as already absorbed into the work itself. In that way (the same goes for both performances), for all of its improvisatory elements, it is able to be decisive and speak to its audience as if there were a shared interest in these discussions, and to also mark out between the performers themselves associations, connections, and recognitions, unforeseen as they might be, but once noticed, available for acknowledgment: a glance from one speaker to another, something taken in, something understood. Not, of course, that an immediacy or transparency of speech and understanding are to be taken for granted, whether amongst the women of the Congress—who might struggle on occasion for an adequate response to the topic, or a way of articulating it, and not all of whom are able to exchange between Polish and English—any more than for an individual with cerebral palsy amongst the participants in the Inventory, who has to be helped to the microphone and whose act of speech in such conditions is a visible effort. Even so, the assembly speaks, is ready and able to speak, and each member of the assembly speaks on his or her own behalf (there are no substitutes here, no actors in that sense) upon a platform that, although it has little about it of the fiction-generating stage, is representational all the way. And an audience attends. We fill the chairs, and we attend. Fig. 2. Vlatka Horvat. 15th Extraordinary Congress (Poznan). Photo: Zofia Kuligowska. Image courtesy the artist. There is, of course, more than one way of attending, more than one way of organizing the situation. At Horvat’s performance, we are arranged in fixed rows, facing the speakers, those living representatives of a “historical” culture that still, it appears, has something to say to us (someone, in any case, is talking in our direction). As in many a theater, we watch and listen from behind the lights: half available to view, I imagine, from the speakers’ perspective, and half not; peculiarly less “there” than they are. At Kaldor’s performance, the rows are no less fixed and facing, but here (as I remember it) the light is shared between us all, and we are so packed together around the performing area, ourselves indistinguishable from those who do stand up to speak, it is as if we might (or might as well) spill onto it, which, in effect, is what happens. Either way, as the performance does draw our attention, we attend (we have to) for the duration. That is to say, we attend not only to what is going on, or to what has already been made and presented, but also—crucial this, I suppose, to any sort of “serial” practice—we attend for what follows, for what happens next. Even if what follows is already anticipated, or is a minimal variation on what has gone before. As if, perhaps (to recall the term introduced earlier) the performance were ever speaking to some sort of pre-political state, in which we intimate or anticipate, now and here, in glimpses, in recognitions, a sudden and unconscionable scaling up of what, for manageability and comprehension, has here been scaled down to a few representative voices, a plotting out of the state of things. Unconscionable, that is to say, as it approaches the scale of political actuality, of human reality, like a gathering of all of our foreign and familiar voices speaking at once, almost intelligible to each other, almost intelligible to ourselves. As if the world and all its elsewheres, its remote experiences, its historical and geographical distances, might blow in amongst us, causing each of us and our concerns to shrink to a dot upon its diagram; as if it had not done so already. Some months later, in another city, someone is again putting out the chairs. The city is Venice, and the place is a wide, square platform, itself surrounded on three sides by cushion-strewn risers and looked over from above by a gallery auditorium, all of which constitutes the Arena of the Giardini Central Pavilion for the duration of the 2015 Venice Biennale. I say, “someone” is putting out chairs. If I remember rightly, there were at least a couple of people involved in this task (they are young, dressed in uniform black outfits, with walkie-talkie devices about their person), doing their job, the sort of job I imagined being alluded to in Vlatka Horvat’s solo performance at the Old Slaughterhouse in Poznan. That is to say, we can take it that this is not the event itself, but a preparation for something to come; and, most likely, given where we are and what is going on, something that will involve sitting down and attending. The setting out of seats in the art gallery or exhibition space, as Georgina Guy reminds us in her forthcoming book on interrelations of display and performance in contemporary visual arts contexts, implies a situation in which a certain amount of time will be spent with the work, a situation not unlike the theater, for instance, and where (it is not an insignificant consideration) it is possible to turn up late, even to the extent of disturbing or spoiling it for others who were there on time. As it is, myself and my companion have turned up in very good time to see a work by Ivana Müller called We Are Still Watching, which is scheduled to begin in twenty minutes or so, and we are currently preoccupied with watching the preparations: the screening off of that gallery auditorium (clearly that there will have nothing to do with this here), the negotiations between more black-uniformed young worker-people with a few curious visitors who have settled on the scatter-cushions on the risers around the platform, and the putting out of the chairs. The latter is peculiar, though. There are roughly the same number of chairs as there were in Horvat’s solo, but they are not being arranged in such a way that they (or anyone occupying the chairs) could be watched, either from the risers or from that now taken-out-of-the-equation auditorium up above, set up as they are in a square, two rows deep, facing in towards the center and across at each other. All is geometrical and, it would appear, objectless. There is nothing but space at the center of the square. As if the attending, and whatever goes with it, will generate its own object of attention, or itself be what is attended. Printed papers, which may well be scripts, are put in trays under each seat, with numbered cards on top. Members of the public (ourselves included) are offered similarly numbered tokens and invited to find our seats, which we do. And then we wait. Müller’s work is a sort of play; or, more precisely, a “reading rehearsal,” to be performed by the spectators themselves. Those are indeed scripts under the seats, each one individually marked up for a different speaker, who will encounter it for the first time when they read out loud. The piece is designed, according to the Biennale catalog, to forge “a community of readers entangled in a shared plot, in which each of them has to discover his or her role. While the script dictates the conversation, the performers rely on each other’s unceasing participation to keep the momentum going. If they persist in their exercise, the script will gradually dissolve to beg the question: “To what extent are the readers also actors?” As it turned out, however, that community of readers never was forged; that unceasing participation never did get going in the first place, not on that particular day, anyway, because no one else joined us on the platform, and the two or three others who had already done so gave up on the waiting (things to do, places to be). It was maybe a general virus of participatory or relational reluctance that had set in at the Biennale over those days: a Dora Garcia piece in the Arsenale the next day was noticeable for its few formidably inviting empty chairs, where again there were scripts to investigate (although without instructions to guide the wary or curious), along with the labors of a reader and a dancer who looked as if they had been putting in some long shifts in that corner. However, it was not Garcia’s piece I had been looking forward to seeing and participating in, it was Müller’s, and the disappointment of failing to do so stayed with me after I left Venice, as did the images, from Poznan and from Venice, of a few dozen empty chairs geometrically arranged, as if—and in the case of We Are Still Watching, actually so—for an assembly of people, an audience, a cast, a public, that fails to arrive, or fails to arrive on time; or, if it does arrive, fails to stay, or is somehow kept from arriving, whether of its own volition or by other forceful circumstance. And this during a global “moment” (the moment is still with us, it has been with us a while) when the reports, the images, the arguments dominating public and much personal life have been to do with exit and attempted arrival, exclusion and the desperations of survival (let alone the vicissitudes for the powerless of effective representation), and at magnitudes that can violate any sense of scale or comprehension, make empathy and identification (let alone action and participation) seem feeble and intractable. Even while, in spite of all, and in more places than we can count, the act goes on, as if it was an ordinary day’s work: putting out the chairs, making an example. These images, these matters, were also in mind when, later in the summer, I was reading a text that I have already referred to in these pages, Bojana Kunst’s Artist at Work: Proximity of Art and Capitalism, a book that would have something to say, in its wide-ranging critique of the production of subjectivity in a number of performance and visual arts contexts, about how Horvat’s performance at the Old Slaughterhouse might be understood as turning the “socially sanctioned loneliness” of the perpetually self-dispossessed while still self-performing project worker, towards the potentially more sustaining “temporality of work as duration.” Kunst’s thinking would also prove provocative and instructive with regard to understanding the “effort” that is frequently called upon from members of the public, along with the structural element of exploitation involved (the capitalizing and consuming of human and communicative forces, as Kunst puts it), in attending live, or participatory, or so-called relational events at contemporary galleries and museums, where the audience’s role is to “perform the public […] at the core of the lack of the public.” That is to say, to function as a life force that will generate the political, social, and affective dimension of the artistic event, on the very same platform where the institution puts its own “lack of a public” on display, and where very little any more is organized through watching (i.e., that peculiar activity that spectators used to indulge in). but rather “through endless re-arranging, renumbering and various assemblages that can appear and disappear together with the negotiations, paths created or decisions taken by the audience at the exhibition.” Kunst suggests, in the course of her argument, that there is a question as to whether the shift towards such performative modes in gallery settings really opens up to emancipatory political articulation, or provides a “refuge for the vanishing processes and possibilities of life.” That might recall for us the ever-present undertone of melancholy—though it is a melancholy that seems to drive a persistent renewal of the attempt—in Horvat’s This Here and That There. Kunst also, however, proposes that if we learn to conceive the audience as something separate from the public—as, I would suggest, Müller’s We Are Still Watching promises to do—then we can see it “as something by means of which we temporarily leave the public outside and rehearse new adventures in how to be together through being separated.” That would be a start, worthy of any rehearsing of how to go on, and go on better, towards the end of things. It is the absent public ghosting around the empty chairs in Horvat’s eight-hour performance that I return to for my own ending, as a way of reflecting on all the works discussed in this essay, and to consider the following, in particular. Which is, that it is not the legibility or otherwise of vanishing or emergent possibilities of encounter and assembly that impresses itself upon me now, nor as it were an inventory of ideas communicated, however deftly, through a geometry of forms, so much as what I might call the “integrity” of a mode of performance labor, which makes these forms of knowledge available (practically) for anyone, for whoever comes. Doubtless, it is a mode of performance that could also be considered ridiculous—and Horvat’s body of work, in performance and in visual art, has been referred to as Sisyphean, so the absurd is not so far away. But it is, I think, in the very ridiculousness of an insistent returning to the point—to the line, the figure, the telling, the reflection, or of remaining with the gesture, the voice—that something of the integrity of these performances resides, in a silent but articulate answer to the question: how to act. A sort of acting that does not attempt to suspend, but embeds itself in the wrinkles of historical time, with an allowance for contingency, for who or what might arrive unforeseen. Offering, for instance, in the setting out of the chairs, not so much an image of an absent public, but an invocation to a remote one, to many remote ones, who are also already here: plotted as equivalences, as quantities, not qualities. The numbers, not the faces; there is no need for the faces. The numbers will have brought their faces and voices with them, when they arrive. Joe Kelleher is Professor of Theatre and Performance at University of Roehampton, London. His books include The Illuminated Theatre: Studies on the Suffering of Images (Routledge, 2015) and Theatre & Politics (Palgrave Macmillan, 2009). We will return to this below, but for a sophisticated conceptualization of what she calls the “attender” of contemporary performance, see Bojana Cvejić, Choreographing Problems: Expressive Concepts in European Contemporary Dance and Performance (Houndmills and New York: Palgrave Macmillan, 2015), 70–72. Joe Kelleher, The Illuminated Theatre: Studies on the Suffering of Images (London and New York: Routledge, 2014). See, for example, Jen Harvie, Fair Play: Art, Performance and Neoliberalism (Houndmills and New York: Palgrave Macmillan, 2013); Shannon Jackson, Social Works: Performing Art, Supporting Publics (London and New York: Routledge, 2011); Bojana Kunst, Artist at Work: Proximity of Art and Capitalism (Winchester, UK and Washington, US: Zero Books, 2015); Alan Read, Theatre in the Expanded Field: Seven Approaches to Performance (London: Bloomsbury, 2013). Read’s book also touches on our questions of knowledge production through a discussion of the role of the public in relation to the research “impact” agenda in UK Higher Education, 173–6. The term “prepolitical,” freely adapted for my own purposes, appears in Hannah Arendt’s writing to designate the (predominantly) domestic sphere in the classical Greek world, a realm of “work” where, under the rule of the head of household, matters of basic survival are attended to, as opposed to the public, political realm of (aristocratic, male) peers where, for some, freedom resides. Arendt ventriloquizes the violence of this worldview: “Because all human beings are subject to necessity, they are entitled to violence towards others; violence is the prepolitical act of liberating oneself from the necessity of life for the freedom of the world.” See Hannah Arendt, The Human Condition, 2nd ed. (Chicago and London: University of Chicago Press, 1998), 31. This Here and That There, along with the next two performances discussed, was presented at Malta Festival 2015, in the Polish city of Poznan. Horvat’s work was shown in the context of “New World Order,” the Idiom section of the festival curated by Tim Etchells. See Malta Festival Poznan, accessed November 2015, https://malta-festival.pl/en/festival/festival-idea. This Here and That There. First performance (Berlin, 2007). For photographic documentation of the Poznan presentation see Vlatka Horvat, accessed November 2015, https://www.vlatkahorvat.com/index.php?option=com_content&view=article&id=319&Itemid=775. The word is a neologism by Auckland-based artist Brent Harris, used to indicate “an exceeding of intention within attending, a relation of passivity and activity in who or what attends.” The passerby is also considered within this ambit; see, for example, Maria O’Connor’s essay, “night drifts,” in Harris and O’Connor, Posteering (Auckland: M/K Press, 2015), 18. Cvejić’s neologism, “attender,” cited above, which derives from Bergson’s concept of “attentive recognition,” would also be relevant here. “The attender’s gaze is attentive because it returns to inspect the body again and again, in search of a perceptible change.” Cvejić, 71. See Emma Cocker’s review of a July 2010 performance of the piece in the Los Angeles River. Emma Cocker, “Vlatka Horvat, This Here and That There,” a-n The Artists Information Company (June 10, 2014), accessed November 2015, https://www.a-n.co.uk/reviews/vlatka-horvat-this-here-and-that-there. Kunst, Artist at Work, 153–75. Key sources on “projective temporality” include Simon Bayly, “The End of the Project: Futurity in the Culture of Catastrophe,” Angelaki: Journal of Theoretical Humanities, 18.2 (2013); and Boris Groys’s essay, “The Loneliness of the Project,” in Groys, Going Public (Berlin: Sternberg Press, 2010). Consider Arendt again on classical Greek slave-owning culture. The freedom of the political realm of shared action and speech (for those with the wealth, health, and status to enjoy it) is underwritten by the prepolitical and constrained private sphere of, for example, household work. See Arendt, The Human Condition. For invaluable discussions on distinguishing the audience from the “public” in performance and theatrical contexts, see Kunst, Artist at Work; and Read, Theatre in the Expanded Field. Henry S. Turner, The English Renaissance Stage: Geometry, Poetics, and the Practical Spatial Arts 1580–1630 (Oxford: Oxford University Press, 2006). It is worth noting that I came to Turner’s work via an online interview he gave to philosopher Robin MacKay, in the context of MacKay’s own research on plot and contingency and the installation/podcast project, “The Ultimate Yarnwork.” See Mackay, accessed November 2015, https://www.urbanomic.com/yarnwork; see also Turner’s own site, https://henrysturner.com. See BAK, Former West, 2008–16, the online research project, https://www.formerwest.org. It should be noted that the assembling is not all, and that the “meetings” that would then take place bear their own frustrations. See Simon Bayly, “We Can’t Go On Meeting Like This,” Performance Research, 20.4 (2015): 39–48. Inventory of Powerless, 2015. See the page on the artist’s site: Edit Kaldor, accessed November 2015, https://www.editkaldor.com/en/index.html. 15th Extraordinary Congress, 2014. For documentation, see the page on Horvat’s site: https://vlatkahorvat.com/index.php?option=com_content&view=article&id=297&Itemid=746. Georgina Guy, Theatre, Exhibition, and Curation: Displayed and Performed (London and New York: Routledge, 2016). 56th International Art Exhibition. All the World’s Futures (Litopat, Verona: Marsilio Editori, 2015), 130–1; We Are Still Watching (2012). 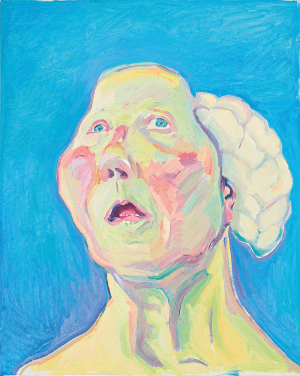 See also the page on the artist’s site: Ivana Müller, accessed November 2015, https://www.ivanamuller.com/works/we-are-still-watching. Kunst, Artist at Work, 175. Cocker, “Vlatka Horvat, This Here and That There.” See also Emma Cocker, “Over and over again and again. Contemporary art and classical myth,” in Contemporary art and classical myth, eds. Isabelle Loring and Jennie Hirsh (Burlington, US: Ashgate), 267–293.